Sometimes nature blows me away with its beauty. 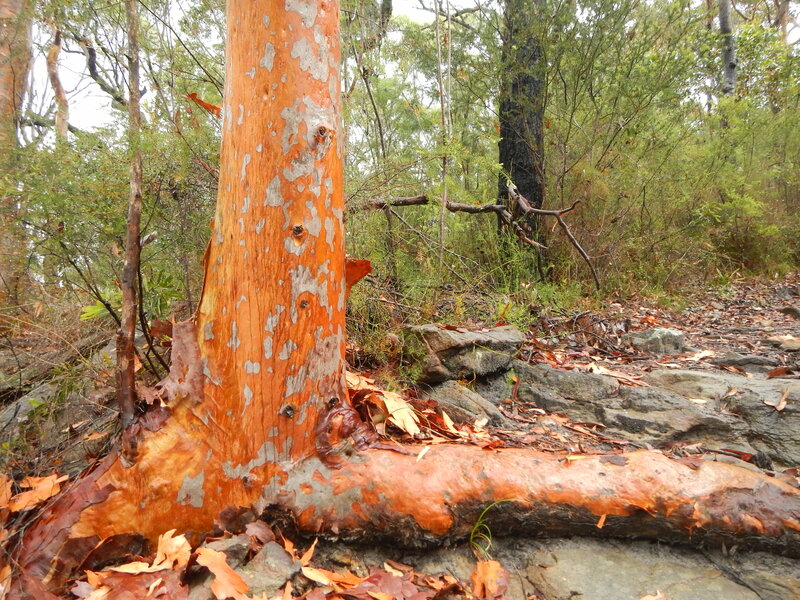 Like this magnificent gum tree, whose subtle colours were given a vibrant makeover by summer rain (actually a summer downpour that turned our walking track in a mini riverbed). Rain gives the bush a welcome spring clean, sluicing away the dust and highlighting things you might otherwise miss, like delicate cobwebs strung between branches and abstract patterns on tree trunks. I came across this tree in Ku-ring-gai Chase National Park, on the Cowan to Brooklyn track, part of Sydney’s Great North Walk, which I did last year (read about how you can do it here). I love the gutsy way Australian gum trees tenaciously grip the rocky ground, draping their trunks over sandstone boulders or, like this one, stretching out across rock platforms in search of soil. Parks Week from 5-13 March is an ideal time to get out and admire nature’s beauty in park near you. See www.parks-week.org. This entry was posted in National Parks, Postcards, Sydney, Travel and tagged gum trees, Ku-ring-gai Chase NP. Bookmark the permalink.